Hundreds of dead fish, some unexplained deaths and a birdless town. Three newspaper reports from Finland attract interest from the British secret service. 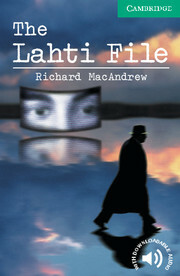 'Foreign Executive' Ian Munro is sent to Lahti to investigate. But when his first contact is killed in front of him, Munro realises that someone knows why he is there... and that they will do anything to protect their secret.Paperback-only version. Also available with Audio CDs including complete text recordings from the book. Contains adult material which may not be suitable for younger readers.